is the name for a family of packet analyzer developed by Colasoft for network administrators to monitor, troubleshoot and analyze wired & wireless networks. Currently, there are three editions available: Capsa Enterprise Edition, Capsa Professional Edition, and Capsa Free . Freeware Network Analyzer (Packet Sniffer) for students, teachers, computer geeks and other non-commercial purposes. is a Network Forensic Analysis Tool (NFAT) for Windows (but also works in Linux / Mac OS X / FreeBSD). NetworkMiner can be used as a passive network sniffer/packet capturing tool in order to detect operating systems, sessions, hostnames, open ports etc. without putting any traffic on the network. NetworkMiner can also parse PCAP files for off-line analysis and to regenerate/reassemble transmitted files and certificates from PCAP files. is a cross-platform packet capture framework for the .NET environment, based on the famous pcap / WinPcap libraries. It provides an API for capturing, injecting, analyzing and building packets using any .NET language such as C# and VB.NET. 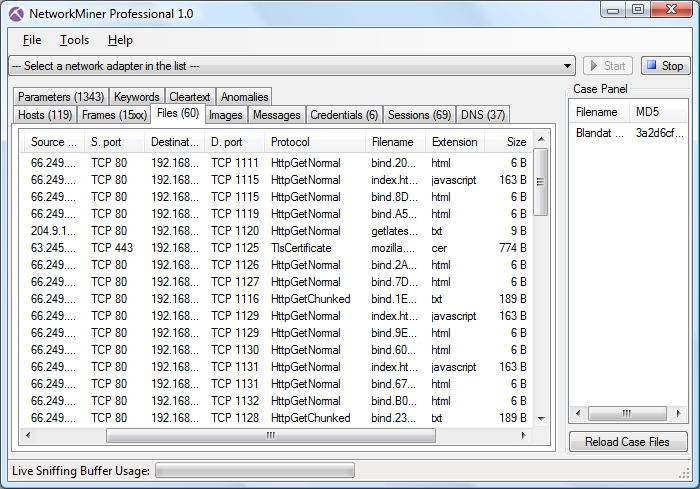 is a free and open-source pcap-based network protocol testing tool. It is used for testing network devices (IDS/IPS, firewall, routers switches etc.,), network troubleshooting, analysis, software and communications protocol development, and education. A GUI PCAP Based Network Protocol Testing Tool.